I love Sabbats. They’re like little check points through the year that give you a chance to look back and see how your intentions are manifesting and what you can add to them to make them grow. According to Judy Anne Nock, author of A Witch’s Grimoire, Ostara, or the Spring Equinox, is the turning point when we have equal amounts of light and dark throughout the day. This time is best for manifesting new beginnings. This Ostara had an interesting vibe because we were between two powerful eclipses that brought energies that, when harnessed correctly, could bring the extra strength and power you need to push your future in the direction you want it to go. The following spell was created for Ostara but can be used when you feel like a chick trying to break out of its shell. Caution: do not use cauldron or candles bear flammable objects. Keep the cauldron, open flames, lighters and matches away from small children. Never leave a burning cauldron or lit candle unattended. Sage your house and cast your circle as you usually would. When you are ready, sit down at your altar. Light the green candle. 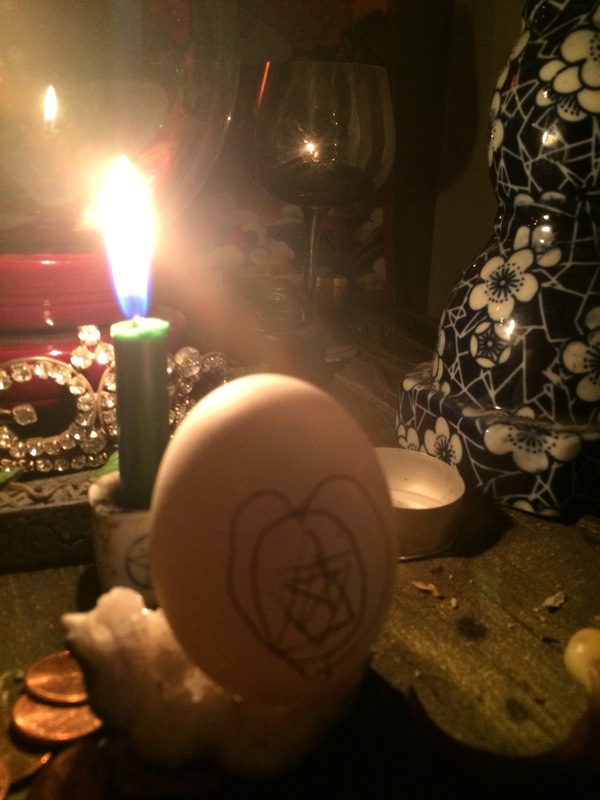 Hold up the egg and say, “Everything I desire I put into this egg.” Take the marker and draw symbols of what you want to manifest onto the egg. The spoken word is very powerful for this spell. As you work, say, “If it’s for the greater good (state intention) so mote it be.” This will be your chant throughout the spell. Next, take the Dittany of Crete and and sprinkle pinches of it into your cauldron. Repeat the chant you used when drawing on your egg. Talk to the smoldering coal and burning herbs. Tell them your secrets and your deepest desires. Fire understands passion more than any of the other elements. Do this until the candle burns out or you slip into a trance. When the candle is spent, take down the circle. Next, bring a pot of water to a boil and hard boil the egg. Do not leave pot unattended while cooking. When the egg is finished, let the egg cool. Then put it on a dish or plate (preferably one blessed for ritual use) and sit in front of your altar. Peel the egg, thinking about your intentions( Save the eggshells, you’ll need them later). Once the egg is peeled, offer the it to the god and goddess. Remain present and grateful while you eat. Don’t eat the whole thing though. Put part aside with the shells. Take the shell, the green candle stub and the little bit of leftover egg outside. It’s best to go to a wooded area. Find a place that speaks to you: a circle of trees or a creek. Call the directions or guardians if you like. Then kneel down and dig a hole, repeating you chant as you dig. Then when the hole is about 6 inches deep, put the shell, candle and left over egg in the earth and bury it as you chant. Dismiss the directions and guardians if you called them and go home. The spell has been cast. So mote it be. This entry was posted in art, mysticism, occult, spirituality, Uncategorized, witchy and tagged empowerment, goals, manifestation, ostara, spells, spiritual, wicca, witchcraft. Bookmark the permalink.